A MAN WITH a scythe cuts into a sea of wheat. His back to us, he is everyman, any man, and war is not apparent. Not until you read the title, “Veteran in the New Field.” Looking at the painting, its wheat stalks hemming him in, I get a profound sense of loss. These are no amber waves of grain, this not the stuff of anthems and glory, not hope or national pride. Instead it’s returning from war and being lost, a theme still trenchant today. 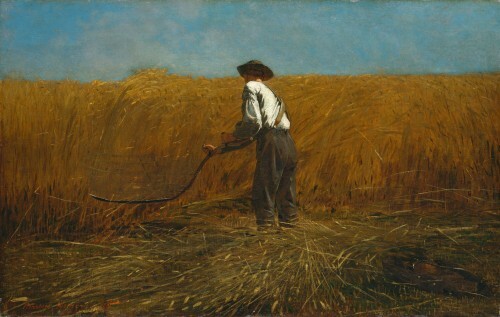 Winslow Homer painted it with an antique scythe, no longer in use, for its Grim-Reaper associations. Add to that other historical details like how in the Civil War crops were destroyed in battles staged across field and farm. Or that after the war the harvest was so great it seemed like providence – or vindication – to those in the North, and the painting’s meaning increases. On an even closer read, you could assume the veteran himself might be Homer. He served, embedded we’d call it today, as an illustrator for Harper’s, and in the painting’s foreground are his regimental jacket and canteen. By accident of his name, looking at the composition I compare it to another Homer, to The Odyssey, and the struggle to return home after war with the metaphoric seas to cross to reach a patient, faithful wife. The Veteran alone makes the Met’s pair of twinned shows commemorating the sesquicentennial of Gettysburg worth seeing. In fact, Homer manages to capture the Civil War’s impact, the perpetual afterwards which seems to continue today in this, our year of anniversaries, with Gettysburg and the fiftieth anniversary of the March on Washington, 50 years since George Wallace’s inaugural address promised, “Segregation now, segregation tomorrow, segregation forever,” and 50 since the KKK firebombed the Sixteenth Street Baptist Church, killing four girls, to this our own year of Travyon Martin and the Supreme Court’s gutting the Voting Rights Act. In other paintings in the show, Homer exposes the dis-ease that resulted after the war in moving works capturing African Americans – Americans finally – in an anxious relationship with their country and future as if he could see straight into the present moment. In the Met’s other anniversary show, “Photography and the American Civil War,” one gallery is full of photos of men, none of whom smiles. To smile is impossible; the exposure takes too long to hold a grin, and the men are solemn with purpose. They stand and stare at the camera, at the viewer, at us. Some still have names; some pose with brothers. Others hold prop pistols and sabers. Some men shell out to have color added to their reproductions in what looks now like an eerie theatricality, rouged cheeks meant to add life and verisimilitude. All hold themselves stiff against death like the earliest portraits painted in New England. These are created as talismans and markers, the “I was here” in case death comes. One man who died anonymously – this the era before dog tags – was identified by a photo of his three children he carried with him. Discovering his name became a cause célèbre. The photograph was republished in newspapers across the country in hopes that someone would recognize the children and attach a name to the soldier, as if in finding that one man’s name, a larger wrong might be righted. Here, the photos of anonymous, lost men are dulling simply by the weight of sheer numbers, and this only a small fraction of such photos created. They pale, however, in the face of statistics from the war: two percent of the nation’s population died and one fifth of all combatants. Other images show pastures of death with bloated bodies, and the starkest image of all is John Reekie’s, A Burial Party, Cold Harbor, Virginia. 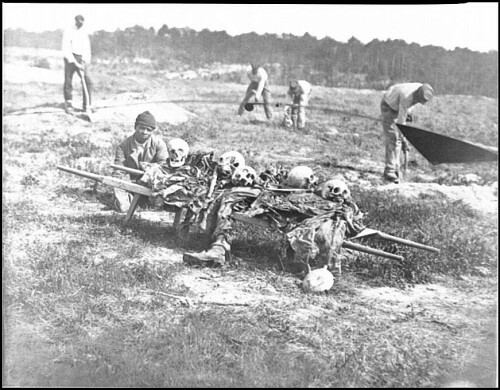 In a field in black and white, four African-American men, freed slaves working for the Union, collect bleached white skulls. The image has an awfulness you won’t see now. John Reekie, “A Burial Party, Cold Harbor, Virginia,” April 1865. From Gardner’s Photographic Sketch Book of the War (1866), vol. 2, pl. 94 Albumen silver print from glass negative. Photography Collection, Miriam and Ira D. Wallach Division of Art, Prints and Photographs, The New York Public Library. This was the first war with extensive photography, and it changed how we saw that war and war in general. Because the equipment was clumsy and heavy – glass plates, cameras as giant contraptions, not to mention exposure times of two minutes or more – the resulting pictures were never of the action, not the moment of glory and the valor of battle but its aftermath. Empty fields, bodies, scarred land – loss. With this, the art of war went from the stuff of history painting, from myth and heroism, to something more meditative. And, because what was left to shoot was often empty fields and barren ground, nature here was freighted with significance. This use of it (a kind of capital-N Nature) was in keeping with contemporary views growing from the romantic Hudson River School and Bierstadts’s overwrought paintings of Yosemite. That red room, the penultimate gallery, is full of medical photos of veterans. Meant as documents of surgery and treatments, the hollow eyes and wounds haunted me. And the show was so dense, by the end I stumbled out dizzy and dazed, unable to string a sentence together as if the show created the sensation of living through a war. I’m not sure that was the intended effect, but the result is almost laudable. Take Homer away from the show and most of what is left is genre painting, hokey at best with a Saturday-Evening-Post saccharine quality like Jervis McEntee’s The Fire of Leaves. In it two kids, one in Confederate dress, the other Union blues, burn autumn foliage. The idea being here that war doesn’t matter to children, or they can transcend it. Or take the painting of a Maine sap house and its workers, which records an interesting fact that abolitionists used maple sugar as a sweetener instead of refined sugar that came from plantations. What stands out are works like Sanford Robinson Gifford’s Fort Federal Hill at Sunset, Baltimore with its solitary soldier and Rothko reds – and the work of Homer. Over and over Winslow Homer, painting war, fighting men or a lone soldier staring at a grave. That composition is all elongated lines, and the trooper’s anonymous face stares down. You don’t even see his eyes. 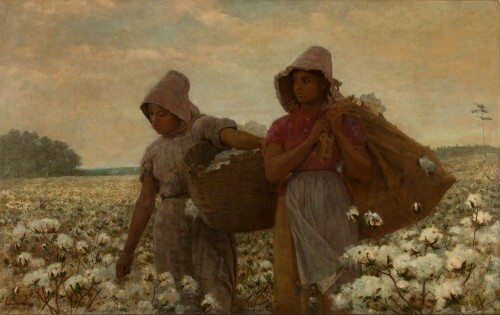 Also powerful are Homer’s African-Americans, like his “Cotton Pickers” or “A Visit from the Old Mistress,” where a white woman comes to implore something from three black women. In these he hints at what’s to come – confrontations and difficulties. With their guarded expressions, his women are more eloquent than words. The uneven quality of the work in “The Civil War and American Art” leaves me with a question: what is the role of art and war or war-art? Seeing the sugar house and burning leaves, which veer on kitsch and propaganda, I wonder what we’re supposed to find in them now 150 years on? Are they documents? Art? A way to understand that cultural moment? And, what is it we now expect of art and war? Do we want Walt Whitman or a witness? Or something more? This question makes me think of another veteran, Vietnam vet Kim Jones and his performances as Mudman. 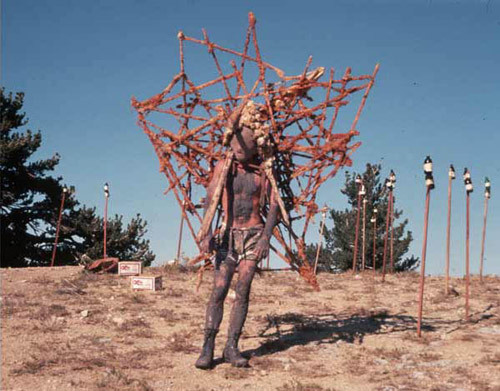 As if channeling his alien presence in the world to which he’d returned after serving, he started appearing on streets and galleries in Los Angeles wearing combat boots and caked in mud with sticks elaborately strapped to himself like some metaphoric backpack a grunt carried. He also makes mural-sized drawings of abstract battlefields populated by endless Xs and Os as if diagrams of battles being fought in his mind. This is the power of Winslow Homer, Kim Jones and Kevin Powers. It’s about articulating the unspeakable. My friend, the one I asked about the Geneva Conventions, has said, “I think fiction – more than history – helps people understand. But I don’t need fiction to understand a soldier’s life in Iraq. Frankly, it’s all still way too close.” Reading those works is for those who didn’t serve, who don’t know. I think here too of how popular war writing is now with Powers and Phil Klay’s upcoming novel or Anthony Swofford. It reminds me of how contemporary art has often asked people (women, blacks, gays and lesbians…) to make work about their otherness. Part of this comes from art and literature’s liberal stance and wanting to understand, and we do need to, but it makes me think of my friend. I keep encouraging him to write about his experiences. He’s had three tours of Afghanistan. On the last all he took to read was Shakespeare. If he doesn’t have something true to say about war, who does? He doesn’t want to write that, though I want him to. Such demands also remind me of what a friend teaching in a prestigious MFA program said about one of the students there, a young veteran. Everyone seemed to plea with him to do something with his experiences, telling him he had insight no one else did. “Faculty members kept saying,” my friend relates, “he had ‘such a unique experience for an artist.’” She found it all patronizing. It was and is, but we also need to understand. When the New York Times reviewed The Yellow Birds last year, the suicide rate among veterans and active duty military was eighteen a day. Now it’s 22. That is nearly one person who has served our country, us, dying an hour. We need veterans to tell their stories, both as documents and art. As my friend who served said, fiction is better to help us understand. And, we do need to understand. Veterans are always woefully under-appreciated after the Civil War and after our current wars. I love art for the multiple meanings it can express, but there is still the power of the document, of a record. 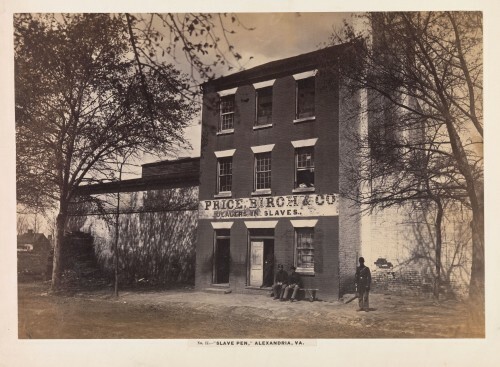 Such is the photograph of the slave pen in Alexandria, Va, something that looks banal, like an old warehouse. I grew up in Alexandria, drove by the building often on my way to high school. I had no clue about its former use or that the firm had been the largest slave traders in the antebellum South. Virginia is the South, but I was from “Northern Virginia,” emphasis on the northern. I look at the photo of slave pen now and think of a bronze statue Appomattox three blocks away. The monument is of a Confederate soldier, facing south, staring at the ground, bereaved upon the Lee’s surrender. The day the sculpture was dedicated in 1889, thousands turned out to celebrate, including Joseph E. Johnston, former Confederate general. When I was little, we’d pass it often taking my dad to the airport for his business trips, and somehow I conflated the two. I thought the statue was my father. I was four. What a Jewish man from rural Pennsylvania who’d had a cross burned on his lawn as a kid could have to do with a defeated soldier fighting for slavery, I have no clue. On the other side of that question is my maternal grandfather’s family. They fought for the South. Someone beat a slave to death. You can read online about Elizabeth Jackson there on Versailles Knoll reciting the psalms praying for forbearance as her sons served. It would be impossible to express in words the horror of this unfortunate conflict. With three sons actively engaged in combat, unrest among the slaves and war-time shortages in all supplies, Francis and Elizabeth tried to cling to their beautiful faith and carry on as best they could. Elizabeth followed a regular morning ritual. When first arising, she would stand on her open south threshold, gaze at the majestic Versailles Knoll and quote: ‘This is the day that the Lord hath made; we will rejoice and be glad in it.’ (Psalm 118:24). ‘I will lift up mine eyes unto the hills, from whence cometh my help.’ (Psalm 121:1). This threshold is considered a sacred spot by the descendants of Francis and Elizabeth. I don’t know how to adjust to the calculus of that. My ex-brother-in-law, the person who took me to my first punk shows, is a Civil War re-enactor. On the Confederate side. He insists when we speak about it, that the war was not about slavery. The statue,Appomattox, got knocked over not long ago when it was hit by a car. It was put up again. It’s protected by state law (a law passed the year the statue was unveiled). What I don’t understand is why it doesn’t get overturned today. Laylah Ali, an artist in Massachusetts, did a video piece recently asking people to film themselves singing “John Brown’s Body,” aka “The Battle Hymn of the Republic.” Here, the stirring lyrics are earnest, patriotic and humble. Taken as a whole, the lone voices singing – black and white, young and old – add up to something particularly moving. Done for the anniversary of Gettysburg, the video project went up on Dia’s website just before the Fourth of July. 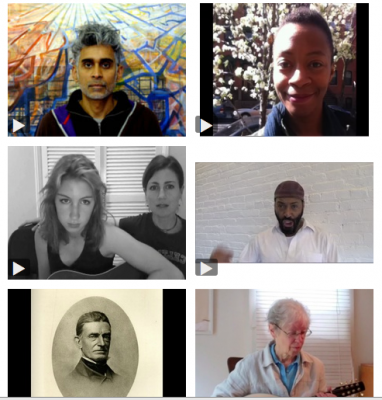 Screen shot from Laylah Ali, “John Brown Song!” 2013, courtesy of the artist. Meanwhile the movie Lincoln, celebrating the heroic efforts to eradicate slavery, changed the names of the Senators who voted against the Amendment, so as not to embarrass their relatives today. And, when it comes to talking about the Thirteenth Amendment, my ex-brother-in-law points out that it passed at the end of the war, not the beginning, as if to prove his point about slavery.